The original Chivas 25 years old was launched in New York City in 1909. It was a creation of Charles Stewart Howard, Chivas Brothers’ third master blender, who sought to create the ‘perfect blend’. The whisky was originally called Chivas Superb Liqueur Whisky “Regal” 25 years old and contained whiskies distilled in 1884 and before. In September 2007 Chivas Regal 25 years old was re-launched in New York City, this time it was a creation of Colin Scott, the current Chivas’ master blender. However Scott used totally different selection of single malt and grain whiskies, the replica is, as we were assured, very close to the original bottling. 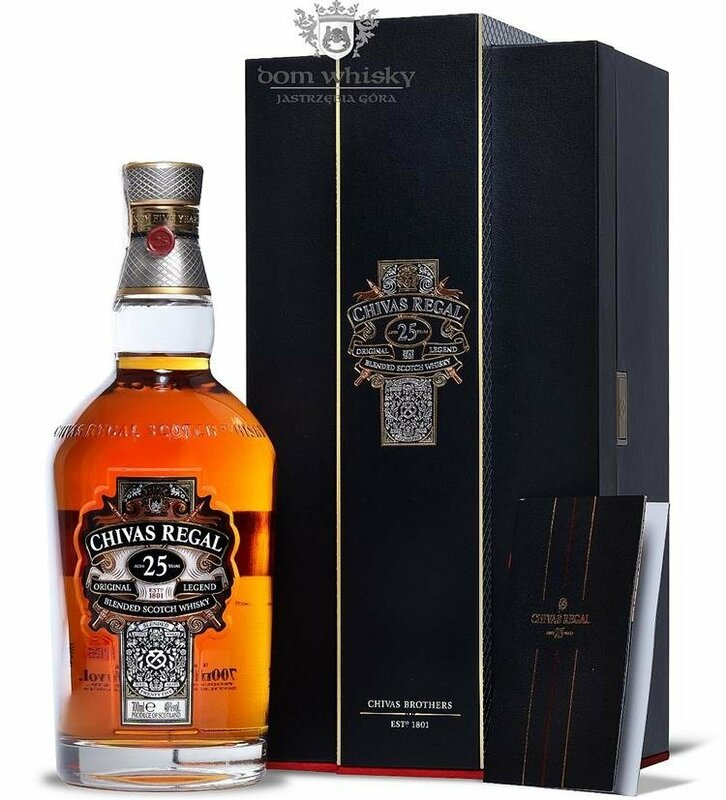 Chivas Regal 25 years old scored double gold medal at the 2013 San Francisco World Spirit Competition. Nose: rich and fruity, cherries, strawberries, peaches, raisins, toffee, vanilla cream, cinnamon, lemon grass, hints of shoe polish and oak. Palate: soft, buttered toast, vanilla, toffee, orange marmalade, pineapples, candied ginger, white pepper, touch of aniseed and delicate oaky bitterness. Finish: pretty long, with notes of oranges, bananas, milk chocolate, vanilla, pepper, mixed dried herbs and oak.